A conductor watches commuters board a train at South Station. Beginning Tuesday, a small army of ticket police will fan out at commuter rail stations and begin what passes for a radical experiment in public transit: making sure passengers have paid for their rides. For commuter rail passengers avoiding fares, the era of ducking between cars or praying the conductor cannot squeeze through the standing room crowd to check off your ticket is soon coming to an end. The Massachusetts Bay Transportation Authority will start a new era of fare collection on Tuesday by placing newly hired ticket agents at the three main stations in Boston to verify tickets of passengers before they board trains. The agents will eventually move onto outlying suburban stations during the morning commute. Passengers who had been planning to buy on-board will be steered to ticket counters or an electronic payment app. While agents won’t check at every commuter rail platform, the goal is to whittle away at some of the estimated $30 million a year in lost fares, and to begin conditioning riders to have their tickets confirmed before boarding. First proposed by Keolis more than one year ago, the ticket-checking system got the green light from the MBTA in March. 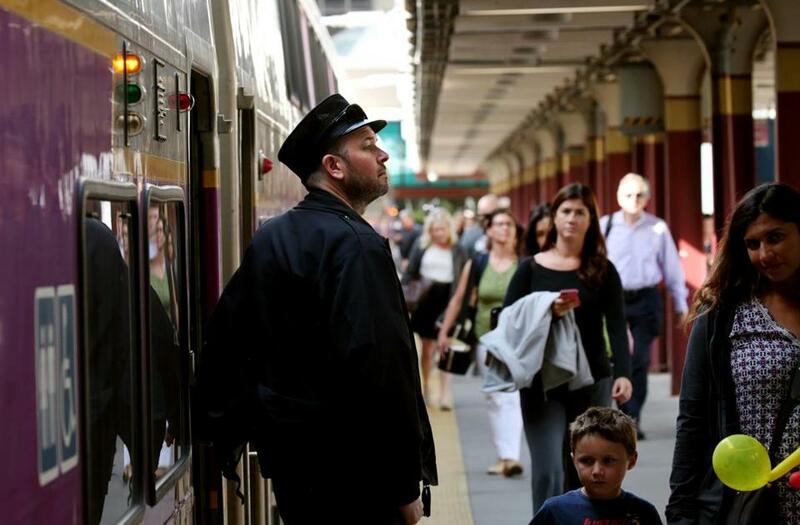 Keolis recently hired 31 ticket-verification agents, and on Friday announced details of the rollout that would begin the day after Labor Day at Back Bay, North and South stations. To get acclimated, they will start during off-peak hours at just one of those stations, spot-checking at different platforms. Within a few weeks, the agents rotate each day among the three stations during afternoon rush hour, and in the morning at suburban platforms. The morning checks will initially be at just one station at a time, but eventually will increase, said Keolis spokesman Tory Mazzola. The ticket agents are part of a broader plan by the MBTA and Keolis to improve fare collection broadly across the system. Keolis plans to install fare gates at the three rail hubs in Boston, first in the form of “manual gates” staffed by workers who would check each passenger’s ticket before boarding. Later, that system would be replaced with electronic gates similar to those used in subway stations. Down the road, the MBTA wants to end cash fares on buses, eliminate the paper Charlie tickets, and introduce direct payments from credit cards and mobile phone systems such as Apple Pay. Those initiatives also involve ticket checkers on buses and Green Line trolleys to ensure passengers are paying if they enter through back doors. Chris Dempsey, director of the nonprofit Transportation for Massachusetts, said the new ticket agents will help gauge the extent of fare evasion. But he warned that stationing gates on platforms may cause some passengers to miss their trains. “The experience of being able to board a train without having to go through a gate is part of the benefit of riding the commuter rail,” he said, noting many passengers are juggling bags while rushing to catch their train. “If all of a sudden we’re saying that person has to pull out their wallet or get their mobile ticket on their cellphone, we’ve inconvenienced that person,” Dempsey said. He said Keolis and the MBTA should instead focus on making it easier for passengers to buy tickets and conductors to collect them, and punishing fare evaders, possibly through increased fines. Dempsey is also skeptical that fare evasion is as large a financial drain as the MBTA claims, because commuter rail passenger counts are imprecise. Mitrou said agents will have discretion to let last-minute boarders bypass the verification process, and if the ticket check creates long lines on the platform, they may ease up until the crowds subside. Conductors will continue to conduct on-board checks, even if passengers showed their tickets to a verification agent. Keolis is still determining the best way to implement the gating systems, Mitrou said. The manual gates could be at North Station as soon as mid-autumn and electronic gates could be in place within a year, but that will depend on the outcome of ongoing studies. Uncollected fares are one of the many enduring problems the cash-strapped MBTA is trying to fix. Officials say that on the commuter rail, passengers may be purposely evading ticket collectors, or the trains are so crowded that conductors cannot check every rider for tickets. As a result, passengers with pre-bought tickets can save them for another ride, while those who planned to purchase a ticket on-board can avoid paying outright. The T and Keolis have described the unpaid rides as unfair to paying passengers, especially those with monthly passes who pay their fares regardless of whether the tickets are checked. Keolis has agreed to fund the $10 million gating system, and will receive a cut of ticket revenue if the T sees an uptick in fares. Presently, Keolis collects revenue for the T but does not retain any of it. Keolis has previously run unannounced ticket checks since taking over the commuter rail in 2014, generally six to eight times a year. But the daily checks will mark a considerable increase in activity. The company does not have any data about how the occasional checks have impacted fares in the past, but when passengers see they are occurring, Mazzola said, they are more likely to purchase a ticket in advance.